A productive leader sees to it that people do their jobs with the skills and commitment needed to produce the best obtainable results at the lowest feasible outlay of money, time, and resources. The most successful leaders are experts at sizing people up, establishing two-way communications, creating environments that motivate greater productivity, and adapting their own behavior to different people and circumstances. 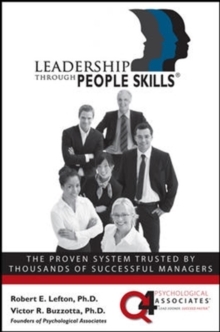 The good news is that these "people skills" can be learned, practiced, and perfected.In "Leadership Through People Skills", the pioneers who developed the Dimensional Model of managerial behavior present a step-by-step procedure proven to help you build your people skills, practice them with understanding and insight, and become a more productive, more successful leader. You'll begin by analyzing the way you manage now, assessing the level of your existing people skills and improving them, and developing different leadership styles that you can use with direct reports, peers, and bosses. You'll learn how to communicate the benefits of any action your propose, create receptivity to your ideas, understand the concerns or objections of others, and respond to these concerns through improved presentation skills. Ultimately, with practice and determination, you'll put all of your newfound people skills to work coaching direct reports, working in tandem with fellow managers, and presenting new ideas to your superiors.Why bother learning and mastering people skills? 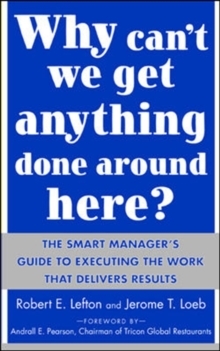 Because the give you the most efficient and effective means available to accomplish your company's business goals; get ahead in your organization; increase your level of job satisfaction; and minimize on-the-job disputes, frustration, misunderstanding and confusion. Why choose this book as your guide? Because "Leadership Through People Skills" presents a proven model for improving your people skills that has already helped thousands of managers worldwide enjoy more productive, more successful, and more rewarding careers. Start building your people skills today and become the effective, successful leader you know you can be. Master the interpersonal skills that boost productivity. It's no secret that people skills are the key to leadership excellence, but developing these skills and learning to use them appropriately takes understanding and practice. "Leadership Through People" skills introduces the Dimensional Model of managerial behavior, which is designed to sharpen your understanding of how people skills work and give you plenty of opportunity to practice them. In mastering the techniques and strategies you'll learn in this career-enhancing guide, you'll discover how to make yourself and everyone around you more focused, more efficient, and more productive. Like thousands of successful managers in leading organizations around the world, you'll learn how to use these skills in the right situations, at the right times, in the right ways with direct reports, peers, and bosses. You'll perfect your: sizing-up skills - interacting effectively through appropriate action; communication skills - strategies for finding out what others are thinking; motivational skills - giving people a compelling reason to do their best; and, adaptive skills - fitting actions to the people for whom they are intended.